LAWRENCE — As historically one of the top 10 agricultural-producing states, Kansas and farming are often considered synonymous. Yet, most of that perception involves wide-open rural farming plots on several acres of flat land. With large industrial and some corporate farming so prevalent, especially in the Midwest, Americans have become more physically distant and also less aware about where their food comes from. Against that stereotype, in recent years, independent farmers have cropped up in the state that is home to many large-scale farming operations. Three University of Kansas researchers are chronicling the lives of these independent farmers who are trying to break into farming, especially with some reliance on some techniques and tools that might be more common in a museum today than out in the field. "In sharing these stories about Kansas farmers with people from across the country researching sustainable agriculture, they were really surprised that these kinds of things are happening in Kansas, too," said Paul Stock, assistant professor of sociology and environmental studies. "Many had suspected it was all wheat and corn and large-scale confined cattle, but they said it was great to hear." Bryon Darby and Tim Hossler, both assistant professors of design, collaborated with Stock on the project, "New Farmers: An Observation of Today's Independent Kansas Farmer," and in April they presented at the Spirit of Sustainable Agriculture conference at Harvard University. The KU researchers have produced a website about the project, in addition to a video and a newspaper with photos and descriptions of Kansans who were relatively new to the farming profession and sustainable agriculture movement. Newspapers are also available to the public upon request. They have conducted interviews with dozens in eastern Kansas who farm on typically smaller plots of land in near-urban settings or who have a high level of involvement with local community-supported agriculture networks. "As researchers with different skill sets and backgrounds, we are trying to understand who these people are that are entering farming in what is a very tough time to be a farmer," Stock said. "Some who have been doing this the longest really were building the architecture for local and regional sustainable foods systems. There's a building element to this that people identifying not just for their livelihoods but saying we think this is important for the community, for access to local food, for soil health, ecological improvements." The project chronicles accounts of farmers who have gone to lengths to finance their own land and farming operations. The Bauman family, which operates Bauman's Cedar Valley Farm near Garnett, sells produce regionally and also has worked on building an infrastructure near the communities of Garnett, Ottawa and Princeton, including working with grocers, starting farmers' markets and buying a meat-packing plant to save jobs in the area. There are others featured in the project who operate on a much smaller scale and utilized the city of Lawrence's Common Ground Program for community gardening and urban agriculture. "There are some farmers who may have farming in the family to some degree, or maybe what they're attempting is a different track, a different model, or a different idea of what farming is," said Darby, who also has an appointment by courtesy in environmental studies. "Everyone we've talked to is hoping or trying to make farming their livelihood." The photographs and media as part of the project focus on older techniques, though many do use newer technology, such as iPhone applications and other methods to operate strategically. A photo of Bob and Joy Lominska of Hoyland Farm near Lawrence resembles the famous Grant Wood "American Gothic" painting. "I do come from a farming family. Hearing their stories and these photos really reminds me of our family photographs," Hossler said. "This is not really a new kind of farming. It's more going back to the old way of farming." A common thread among all the farmers is an independence of larger agricultural systems that leads them to focus on local food systems and the farm-to-table movement. Many of the farmers are fixtures at area and local farmers markets that offer fresh produce and a community atmosphere as well. "Certainly the unaffiliated aspect and positioning themselves outside the norm, which I think is an identity thing, is important to these farmers," Darby said. In addition to the focus on sustainability and a local food movement, the multimedia project has also brought to light some of what attracted people to farming. "When I was gardening, it was more of a relief to be in nature, and then as it became more of a profession, it was day in and day out," said Jessi Asmussen, a grower with Mellowfields Urban Farm in Lawrence. "So it's become my work, and certainly I am reminded all the time that I am in nature." Also the image of a farmer, simpleton or a hick, as agrarian activist Wendell Berry has noted, is prevalent, especially in today's popular culture. "Farmers are almost completely ignored, the expectation, both in academic literature and the wider public is that farming is going to just disappear as a profession. We're going to mechanize it. Somehow we'll still get food," Stock said. "Yet somewhere here we're confronted with people who are voluntarily leaving other professions to farm. They're saying, 'I want to do this. I want to raise my family in this way. I want to work as partners in this.'" A Starter Grant from The Commons with funds from the KU Office of Research and a Collaborative Research Grant from the KU Hall Center for the Humanities supported the project. The research team has applied for the Dorothea Lange-Paul Taylor Prize through the Center for Documentary Studies at Duke University. 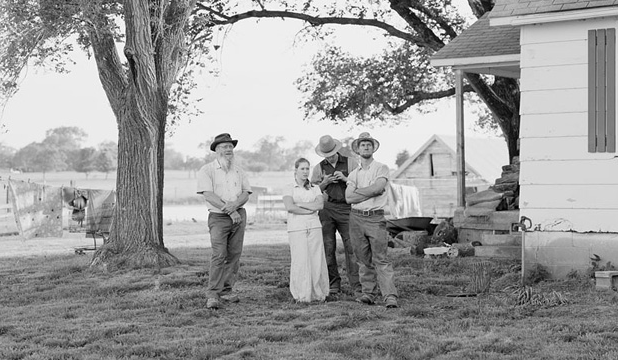 Top photo: John, Joanna, Ivan and Steve Bauman talk with University of Kansas researchers on Bauman’s Cedar Valley Farm near Garnett. 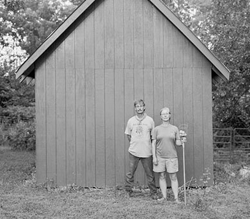 The Bauman family is active in building a sustainable food infrastructure in the Garnett, Ottawa and Princeton region, and they were featured in the New Farmers Project on experiments in contemporary farming by KU researchers Bryon Darby, Tim Hossler and Paul Stock. Top right: Kevin Prather works in a field at Mellowfields Urban Farm in Lawrence. Center right: Bob and Joy Lominska re-enact a version of Grant Wood’s "American Gothic" painting on the Hoyland Farm near Lawrence.